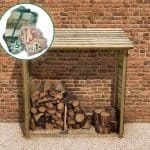 Log stores are always handy structures to have in a garden for those who have a log burning stove or chiminea, or who use logs or firewood on their open fire. 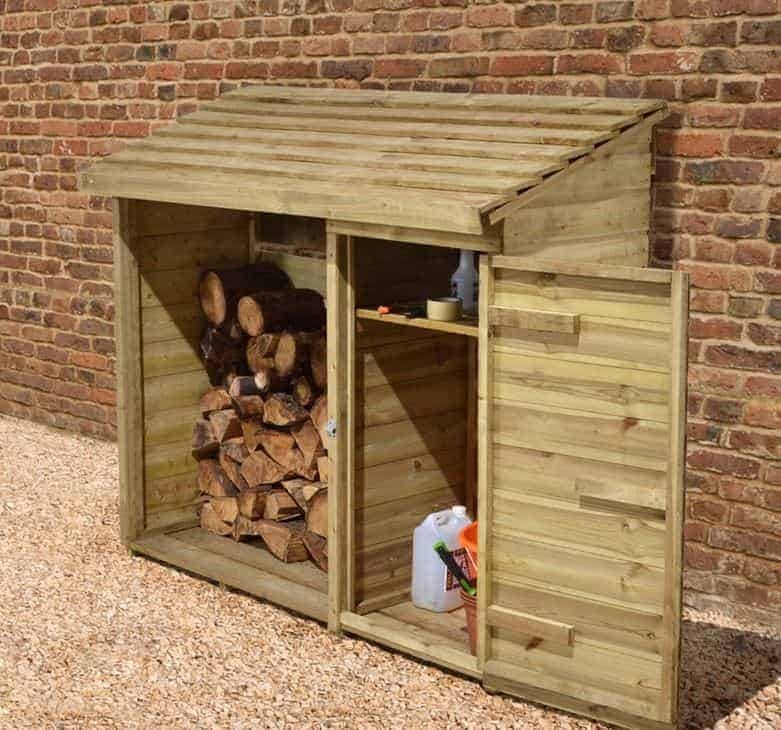 This, however, is a log store with a difference as it offers even greater value by being a well sized log store and tool shed all in one structure. It does this through an integrated yet separate side compartment that features a lockable door. The store itself is one of the widest that we’ve seen, yet it’s not as tall as many that we review. 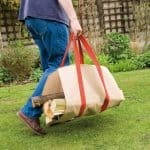 That means you may not fit as many logs inside as you would in a dedicated store, yet we still feel it has enough space for an average household’s log consumption, as well as space to hang items such as saws, trowels, and secateurs. 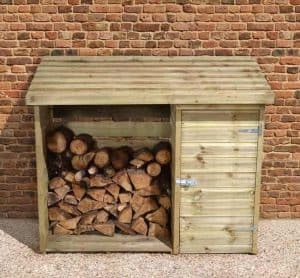 The store has a slatted roof and rear wall oriented in a pent style, which allows the logs to breathe and encourages them to dry out quickly. It was good to see that all the cladding used on the shed was pressure treated, as it’s therefore very long lasting as shown by a 15 year anti-rot guarantee provided by the manufacturer. 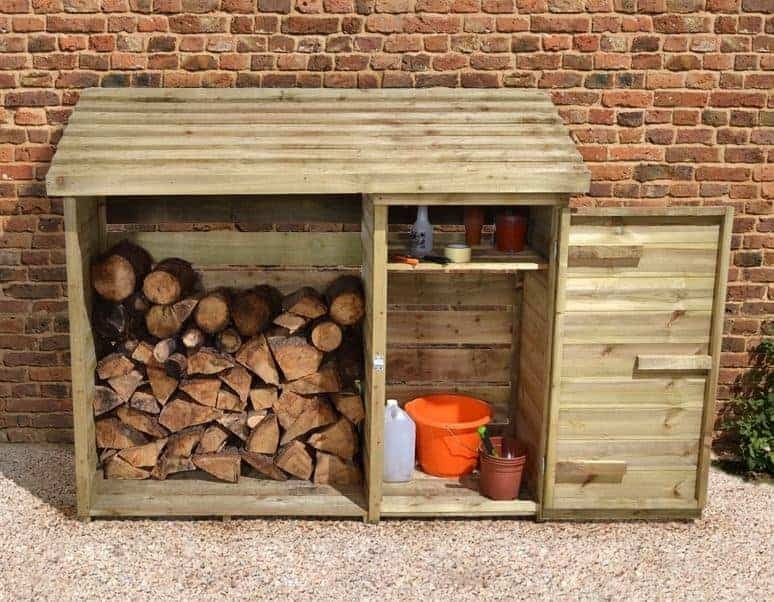 We liked the unique design of this log store at first sight, as it gives a modern twist to a traditional styling by combining the open front commonly associated with log stores with a closed side area that’s perfect for garden tools and equipment. The side area tool shed itself also has a built in shelf, making it easier to store things neatly and efficiently. In effect, this combines all of your gardening needs in one compact structure, and it’s one that will fit in perfectly with a traditional garden environment. At the top of the store is a pent style roof featuring overlapping slats, and it’s excellent at carrying water away from the interior. 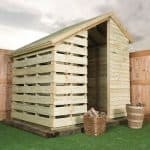 This isn’t one of the taller log stores we’ve reviewed, however, with a peak height of 1.46m and an eaves height of 1.23m. 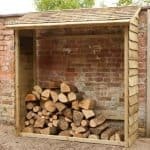 When deciding where to site this log store you’ll also need to consider its overall width of 1.76m and its overall depth of 0.69m. We were pleased to see that relatively thick 12mm cladding had been used throughout, as some log stores we see utilise a thinner roof as a cost saving measure. The roof and the sides are both arranged in a shiplap style, while the back and floor are open slatted. Once assembled, this store feels reassuringly solid, even though the 28 X 28mm frame isn’t as solid as thick as some that we see. Whilst the floor itself is strong enough to take the weight of a full load of logs, the thing we liked most about it is that it’s supported by pressure treated floor joists. By raising the floor above ground level, the joists help to prevent the possibility of rot being caused by the high moisture content commonly found there. Because the sides and roof feature rain repelling shiplap cladding, rather than being open slatted, this structure has more weather protection than we usually see with log stores. 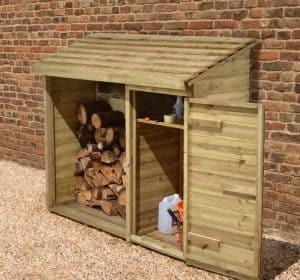 This can be improved further by placing the slatted back against a wall, whilst the open front will still ensure that logs and firewood get the ventilation they need to dry them out. This weather protection is not only good news for the logs, it can also extend the durability of the structure itself. We were pleased to see that wood preserver had been applied to all the timbers using a pressure treatment process. This not only gives the timber a faintly greenish tinge it also means that the cladding has a very effective protection against rot for years to come. Just how effective this is can be gauged by the 15 year warranty against rot provided by the manufacturer. The manufacturer also states that no preservative treatment will need to be applied by the customer during this period, although we would still recommend inspecting the wood every year or so. 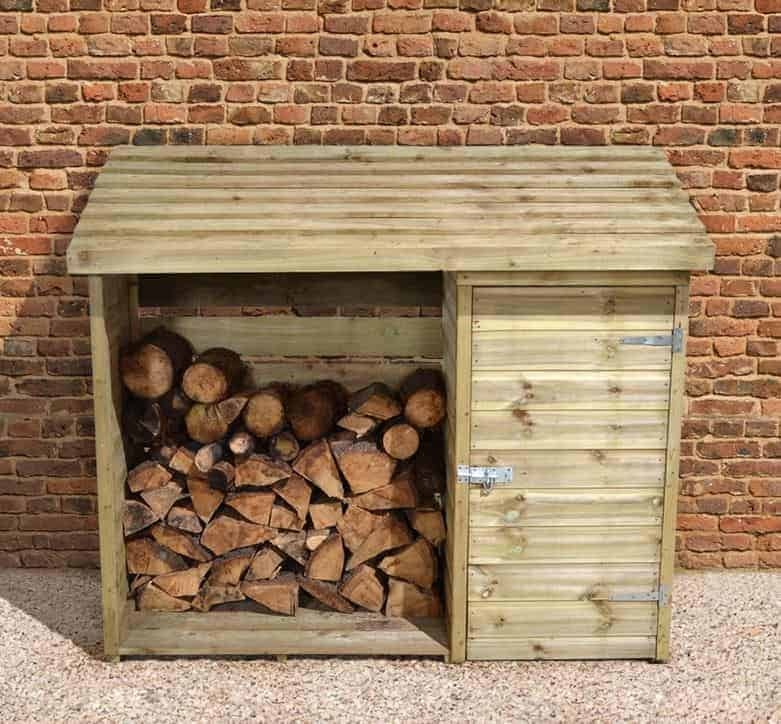 One treatment we would definitely recommend is the use of a paint or stain to keep harmful UV rays away, so it was good to see that tubs of DIY treatment in either dark or golden brown are available to buy as an optional extra with this log store. 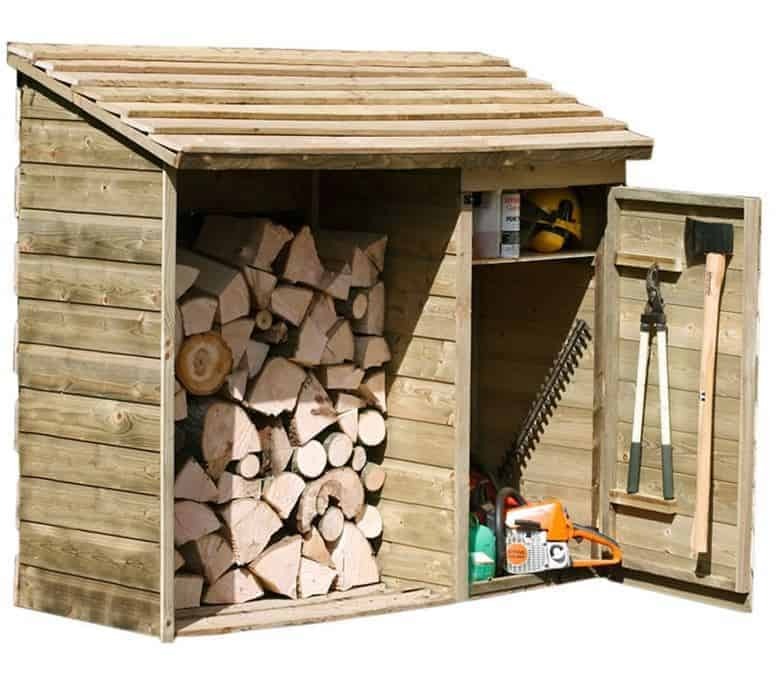 The tool shed section can store a large selection of items, many of which may be of some value, so it’s important that shed security is considered. That’s why we were pleased to see that the shed door, which is 0.65m wide and 1.13m high, features a bolt that is padlockable. No padlock is included, which is something that we would have liked to see, but they can be purchased inexpensively and it’s also possible to buy a padlock system with inbuilt alarm for not much more than twenty pounds. Attention has been paid to quality throughout this log store and tool shed, as shown by the use of pressure treated floor joists. On top of a highly effective pressure treatment, the roof and side timbers are also protected from water ingress by their shiplap design that bounces rainwater away. This should lead to a durable and reliable structure. This may not be able to fit as many logs inside as many stores that we see, but this is made up for by its ability to keep garden tools in storage as well. We had thought that the dual design may make this a little more complex and therefore time consuming to assemble. The instructions are clear and easy to follow, however, so installation can still be completed by two people in around two hours. 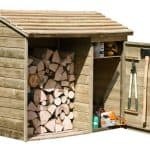 If this was purely a log store then we would recommend less costly and bigger models, but the inclusion of the tool storage area as well means that this provides good overall value for money. 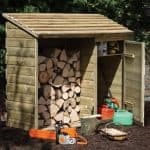 Final Thoughts: Do you want both a log store and a tool shed in your garden, but are worried about the space that they will take up or the cost of buying two garden buildings? If so, this could be your ideal solution. 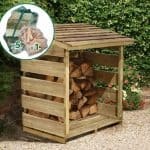 It neatly combines both of these features in one unit, and whilst it isn’t particularly large it can still hold a plentiful supply of both tools and logs. A padlock is one extra we’d strongly recommend, as is the use of an exterior paint or stain, but other than that this product has everything you need straight out of the box.